Several Denver students were among a dozen or so teen musicians performing on NPR radio show “From the Top” before a live audience taping recently held at the King Center on the University of Colorado Denver campus. Performing with film and tv composer Danny Elfman (“Nightmare Before Christmas,” “Silver Linings Playbook,” “The Simpsons,” “Spider Man 3,” etc.) and acclaimed pianist and “From the Top” show host, Christopher O’Riley, was an opportunity of a lifetime. We’ve chosen to highlight two of the soloists from this episode of “From the Top” because their backgrounds are particularly unique. Each has faced challenges while pursuing their musical passion. Both have made sacrifices for the sake of becoming more proficient musicians, from long hours of practicing to financial sacrifices. At the same time, their determination and perseverance have helped them blossom into extraordinarily fine young musicians. Abigail Enssle, 17, is the fourth of eight children, all of whom play an instrument and have been homeschooled in Boulder, Colorado. 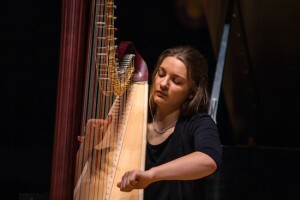 She’s been taking harp lessons since age five, and has played in the Greater Boulder Youth Orchestras and the Denver Young Artists Orchestra. In 2014, she won first place in the Broomfield (Colorado) Symphony Orchestra and the Boulder Philharmonic concerto competitions. Think homeschooling means you can sit around playing music all day? It’s just a myth, says Abigail. In fact, it’s quite the opposite for her. In addition to homeschooling, she takes classes at a local community college, helps her mother with the homeschooling of her four younger siblings, and is very involved with her church, family, and extracurricular activities. Through careful planning, she still manages to carve out two hours a day for practicing harp. Abigail knows what it’s like to work hard for what she wants. She spent long hours working at a farm stand to help pay for her towering, 86-pound Lyons & Healy harp. Through dedicated practicing, she earned a spot in the Denver Young Artists Orchestra and tour of Europe during the summer of 2014. She also learned through trial and error about some of the occupational hazards of being a harpist. Abigail is committed to using music to touch those in difficult circumstances. Some of her favorite experiences have come from performing at a hospital for children, a senior residence, and a nursing care facility. She is also committed to educating others about her instrument. While many think of the harp as mainly an instrument for wedding music, Abigail points out that it is a far more versatile instrument on which she performs music written for guitar, piano, and violin. What does Abigail have to offer other young musicians who would like to perform on the radio as well as gain other recognition for their music? As for her future plans, Abigail is uncertain. She knows music will be a part of whatever she does. She’s also well aware that building a career just in music can be daunting. Her passion for working with people may also lead her in the direction of nursing. Scott Chiu moved from Taiwan to Denver, Colorado in middle school. With just six months of English language classes under his belt, he was suddenly immersed in an all-English-speaking arts school so that he could focus on the clarinet in addition to his schoolwork. At age 19 and about to head off to college in the Fall of 2015, Scott has found his niche at the Denver School for the Arts. 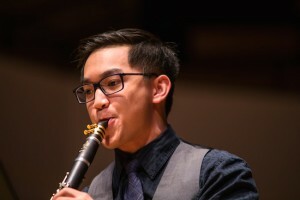 He’s also been recognized as a talented clarinetist who has performed with the Denver Young Artists Orchestra as well as in his school’s woodwind quintet on Colorado Public Radio and at the Colorado Music Educators Association Conference. Scott won a Downbeat award with the quintet, and is a 2015-16 Young Musicians Foundation of Colorado artist. Scott’s career goal is to become a soloist as well as play in a symphony. He seems undaunted by the hard work it takes to get even a shot at attaining those goals. When asked whether he gets nervous before a performance, he offered these and other tips to students who might like to follow in his footsteps and get a chance to perform on the radio. What’s the secret to getting your music heard on the radio? Visit From the Top show #302 to hear the show featuring Abigail Enssle and Scott Chiu and other young musicians. 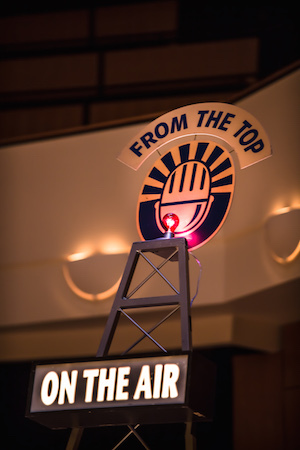 “From the Top” is a National Public Radio (NPR) weekly radio show that offers classical music students ages 8 – 18 a chance to perform for radio listeners in 141 U.S. cities as well as international locations. Shows are taped before a live audience, and are hosted by internationally-acclaimed pianist, Christopher O’Reilly. In addition to performing, students who audition and are accepted can apply for Jack Cook Kent scholarships to help pay for lessons, instruments, and other expenses related to studying classical music. 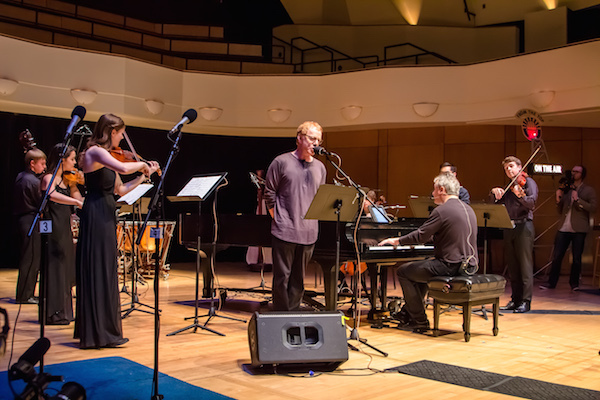 Special thanks to: University of Colorado Denver College of Arts and Media for hosting “From the Top,” and to Boulder Piano Gallery and the Denver School of the Arts for graciously providing MajoringInMusic.com the spaces to interview Abigail and Scott for this article.